To view work schedules for yourself or your staff, simply click on Settings in the side menu. From the Staff section of Business Details select Manage Staff. Note: If you work outside the normal working hours then you will be prompted to enter staff rosters from the Appointments screen. Click on the enter staff rosters link. The Staff Search will appear. Click on the staff member that you are attempting to update. You will be taken the Details tab which allows you to update the details for the selected staff member, such as name and contact details. To update work hours, select the Work Schedule tab. In the Work Schedule tab you can edit existing rosters, or add a new one. To edit an existing roster, select Edit next to the roster that you wish to update. The Setup Work Hours for Staff screen will appear. Select the Week Starting date, please note that the calendar starts on a Sunday and not Monday. If you want to repeat the roster then select a number of weeks from the Repeat for field. 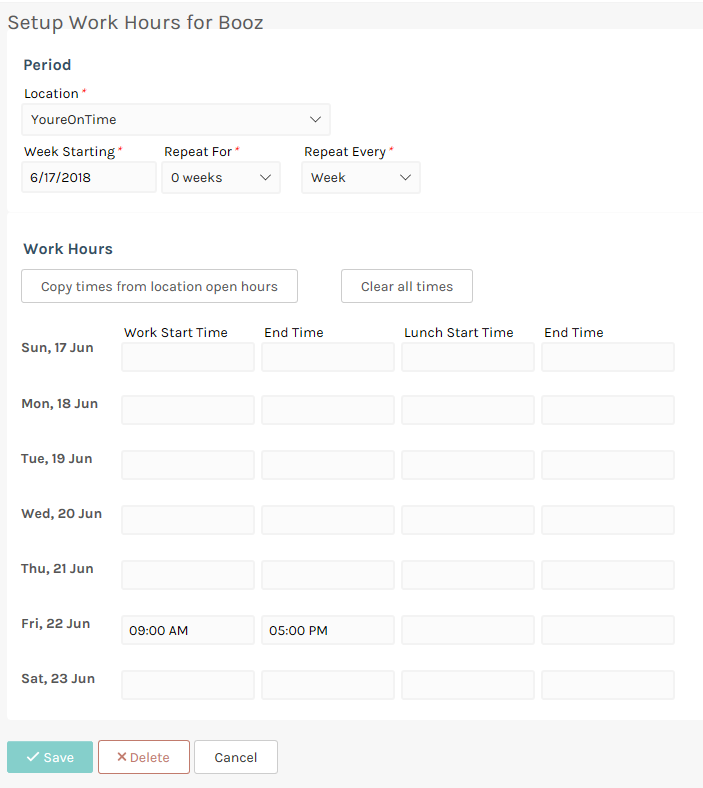 You can then add Work Hours for the required days, or choose to match the roster to your opening hours by clicking the Copy times from location open hours button. To save this updated roster, click the Save button and you will be taken back to the Staff Details screen. To see the updated roster, select the Work Schedule tab. The updated roster will appear in your list. To Add a new roster, select the Add Work Hours button on the Work Schedule tab. The Setup Work Hours for Staff screen will appear. Select the Week Starting date, please note that the calendar starts on a Sunday and not Monday. If you want to repeat the roster then select a number of weeks from the Repeat for field. 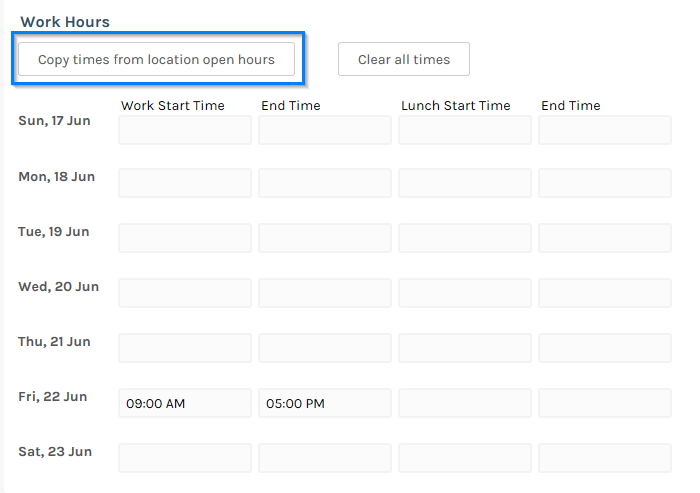 You can then add Work Hours for the required days, or choose to match the roster to your opening hours by clicking the Copy times from location open hours button. To save this updated roster, click the Save button and you will be taken back to the Staff Details screen. Need to add staff breaks? See our article on adding staff breaks to learn how. Once your working hours have been set, you can start adding your appointments!